Full disclosure: I made this soup 2 days ago, also, for my house’s portion of an 11th street progressive dinner. And then I made it again because it was so good. It was the perfect amount for ~10 people at a dinner party or 2 people for lunch one day and breakfast the next morning when your eggs have somehow turned gross overnight. Start by dicing up your onion (I used red onion because that’s what i always had). Heat 1 tbs olive oil in a soup pot or dutch oven and let your onions simmer, covered, for about 5 minutes until soft. While the onions are getting happy, peel and chop your carrots and parsnips into ~1 in slices. 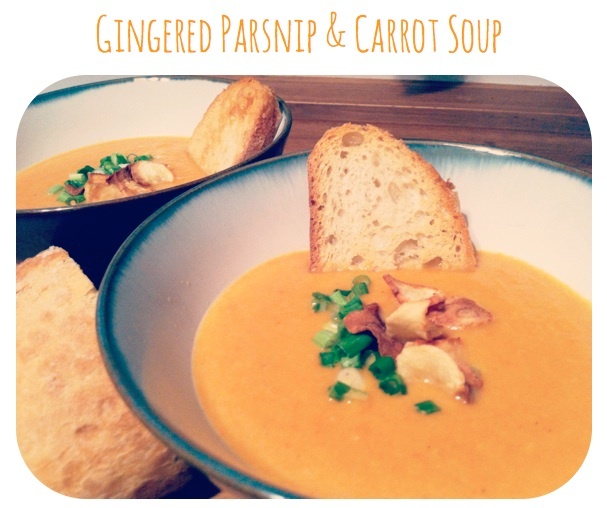 Add your parsnips, carrots, ginger, stock, and water. Bring this to a boil, then reduce to medium-low heat and cover. Let this simmer for ~40 minutes until all of the veggies are tender. Remove the pot from the heat for about 10 minutes. Then blend using a food processor or your new adorable green emulsion blender. I chose the latter 🙂 Season the soup with salt and pepper, to your taste. 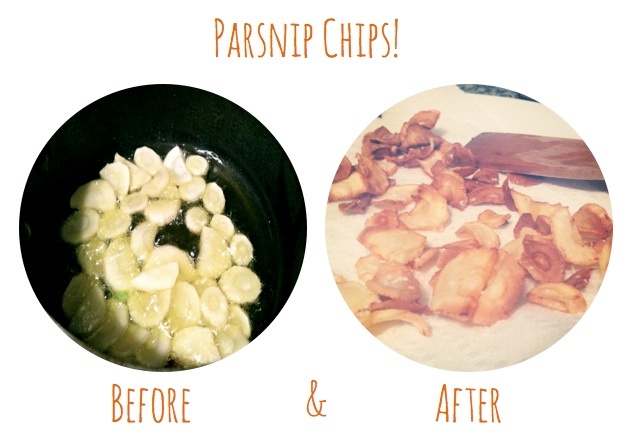 And to top the soup, heat 1 tbs olive oil in a small saucepan and crisp up the thinly sliced parsnips until golden. Finish with chives. But wait! You’re not quite finished yet. 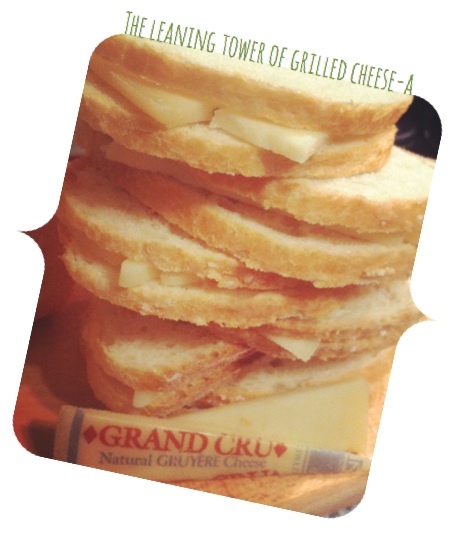 I made some tasty gruyere croutons (which translated to a gruyere grilled cheese for our lunches). Layer slices of Gruyere cheese between two thin slices of french bread or ciabatta and bake at 375 for ~15 minutes or until toasty. Cut them into halves or into croutons.